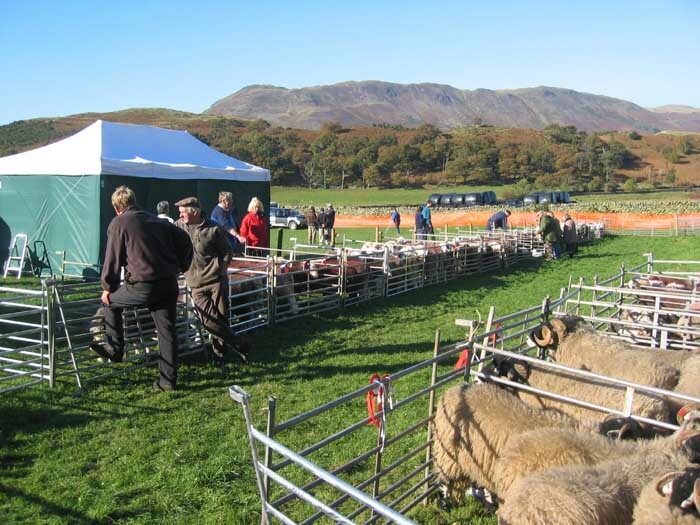 Occasion : The Buttermere Show, Lanthwaite Green. With : Anne and Andrew Leaney, Ann and our dogs. 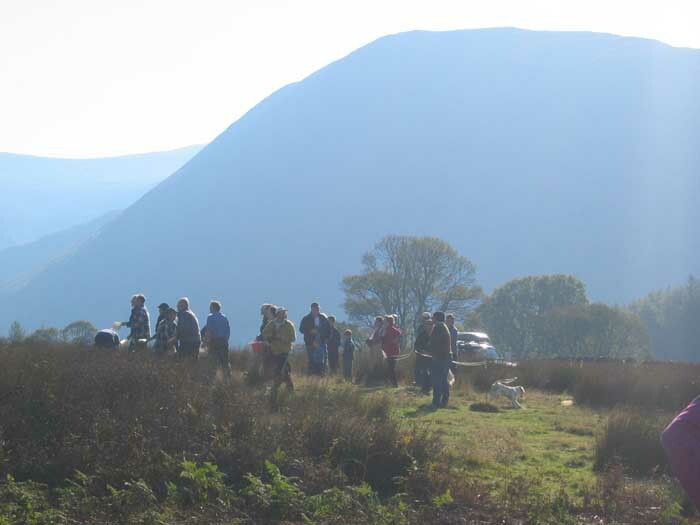 and this year it was blessed with excellent weather and a good turn out of both participants and visitors. 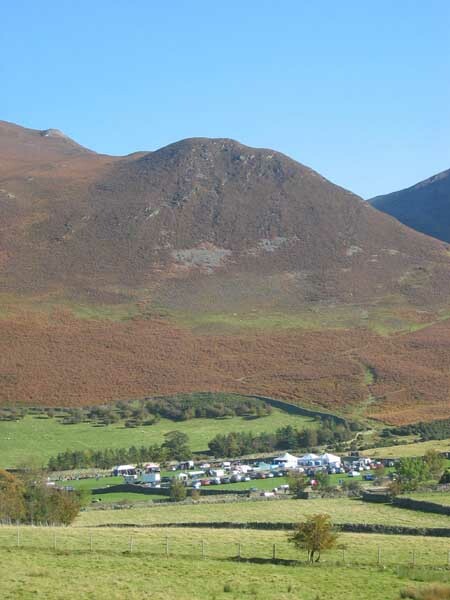 The showground is actually at Lanthwaite Green, beneath the western end of Grasmoor, which makes an impressive backdrop for the event. 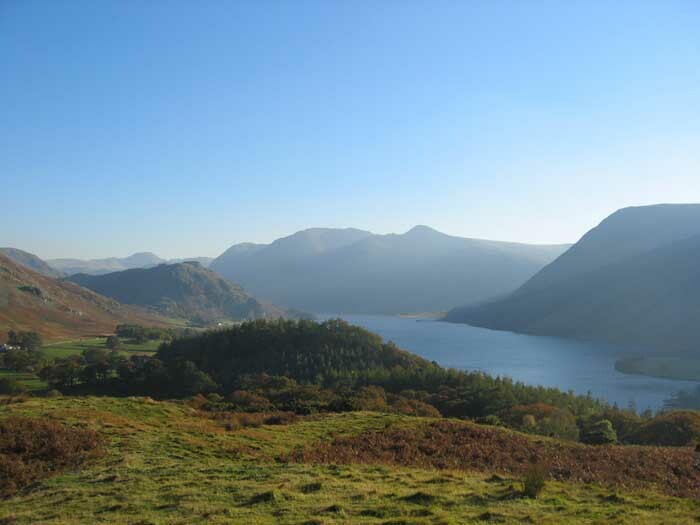 This view is of Grasmoor and the Buttermere valley from Loweswater itself. Haystacks and Great Gable are the furthermost mountains at the head of the valley. 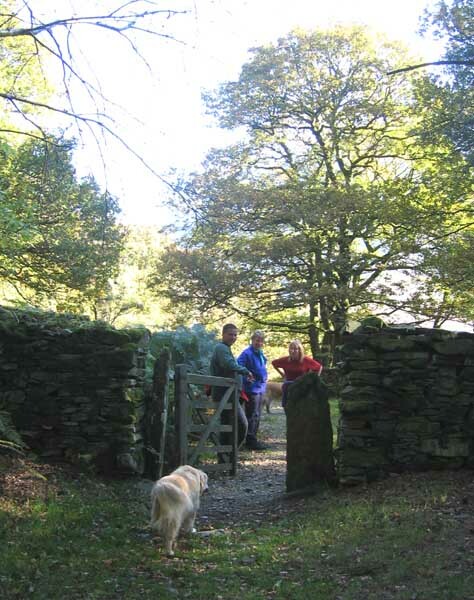 From Loweswater we walked up through the Scale Hill woods, passing "Lanty's Cave" on the way. 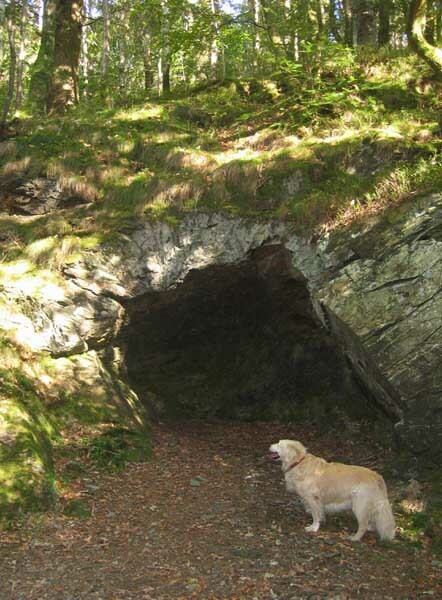 He was a local villain back in the 1800's who was supposed to hide here when he was not the "flavour of the month" but the cave probably owes more to local mining than anything he did to build himself a hideaway. 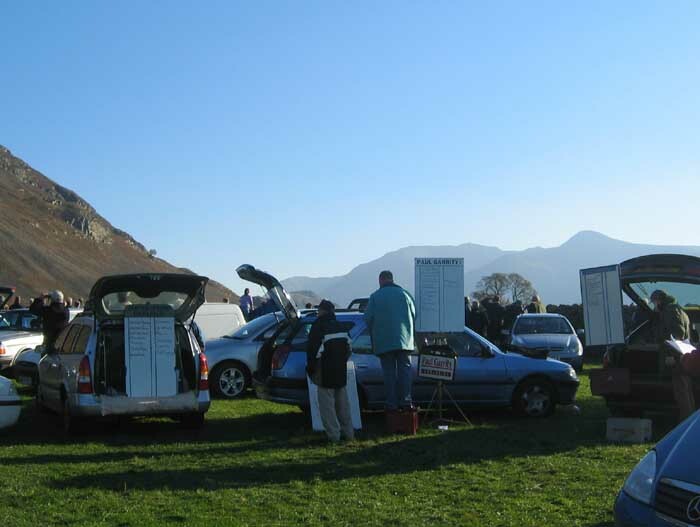 As we exited Lanthwaite Woods, we could see the show ground and the car park filling up, and as the music wafted across the fields on the slight breeze, the PA system let us know that the event was already underway. "Late again" I hear you cry. 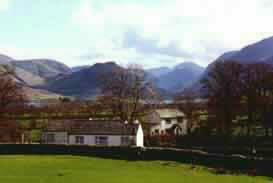 The fell in the background is Grasmoor. 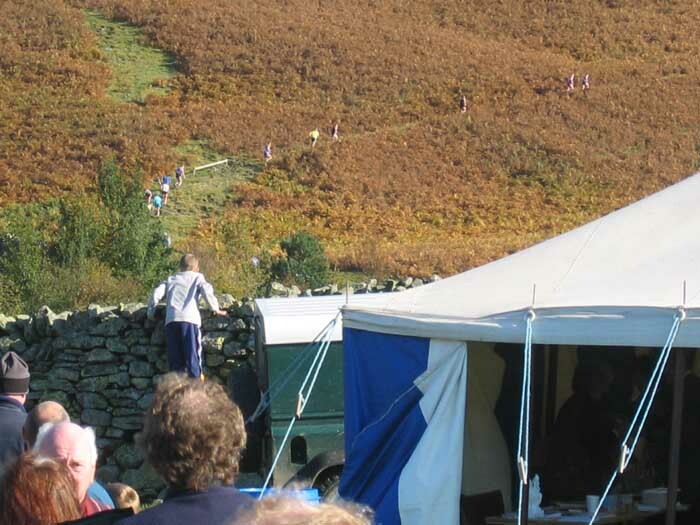 To the left is Whin Benn, an outlier of Whiteside, and the location of the senior fell race later in the day. 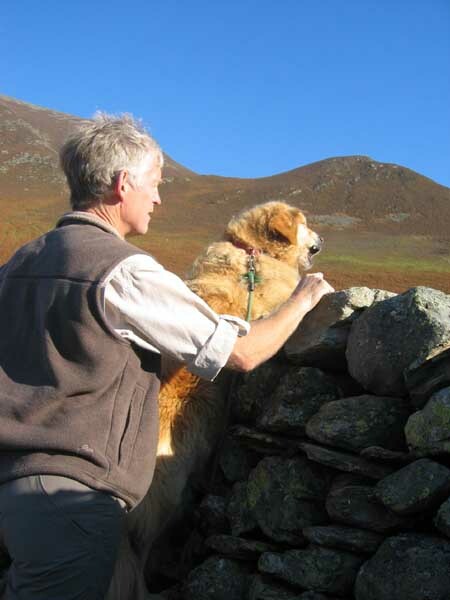 Buttermere is more of a Shepherds Meet, and as such doesn't have the extended classes of animals that other shows have. They do, however, have some of the best Herdwicks to be found in the whole of Cumbria. A prize winning pen, all beautifully dressed in their red ochre colours. 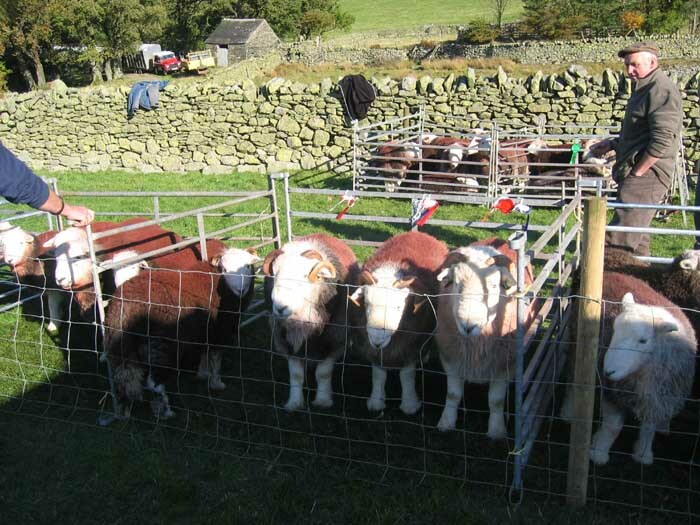 There is quite an active breed society, and on display were many of the bi-products of Herdwick wool. Not only were there sheepskin rugs, but woollen knitted clothing, caps, ties, blankets and even carpets. 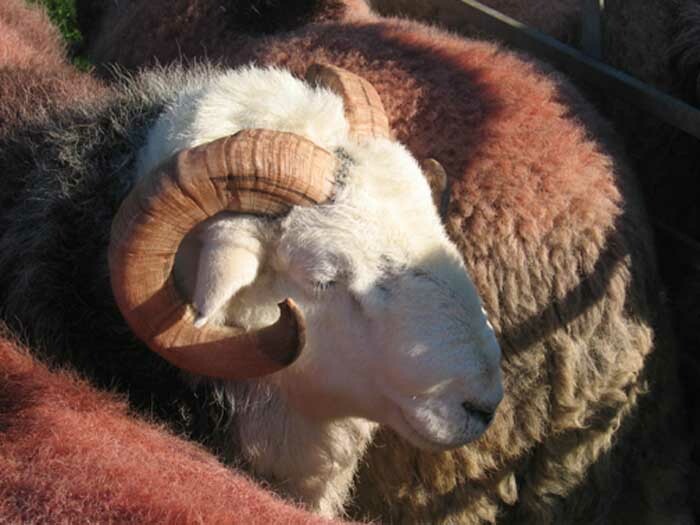 The latest idea for loft insulation too is based upon Herdwick wool. The natural fibre is much safer to use than Rockwool, and it's insulation properties are excellent of course. The sheep can vouch for that. 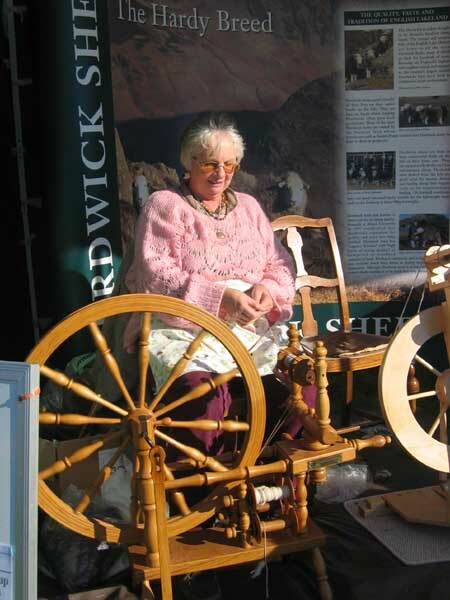 Here Theresa Southgate was giving spinning a demonstration. 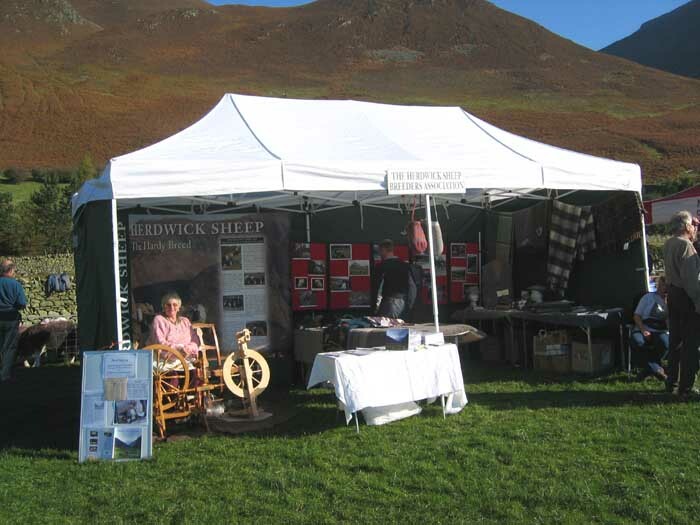 Copies of her book which illustrated Herdwick Heritage, walks and recipes, were on sale at the stall. 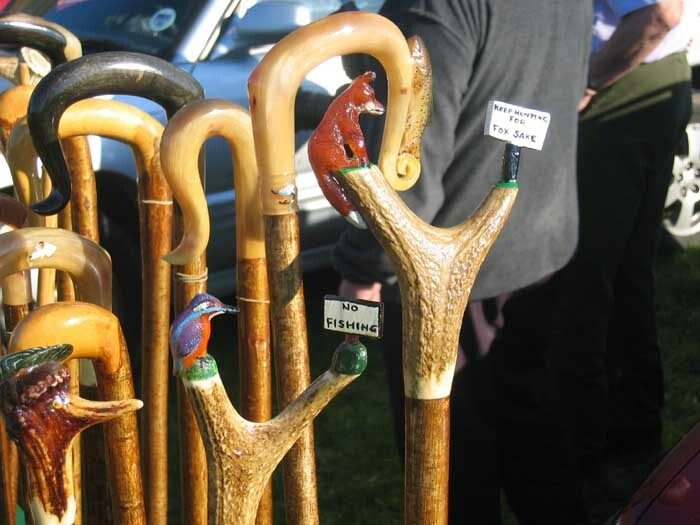 The stick makers craft was well represented, with traditional wooden walking sticks and crooks, and also bone and antler designs crafted and coloured to perfection. The Kingfisher with " no fishing" and the fox with the more political slogan "keep hunting for fox sake". 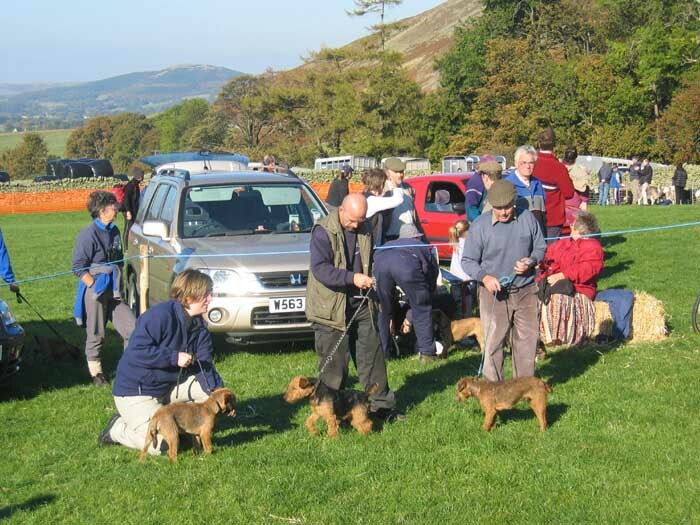 The Lakeland Border Terrier Class - Champions parade. 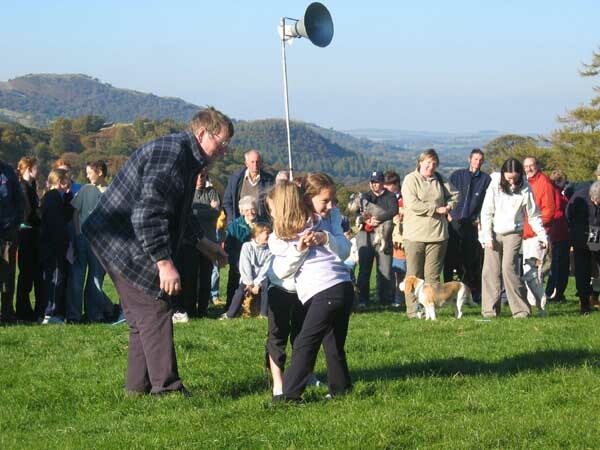 One of many dog competitions, which included classes from pets to Shepherd's dogs. 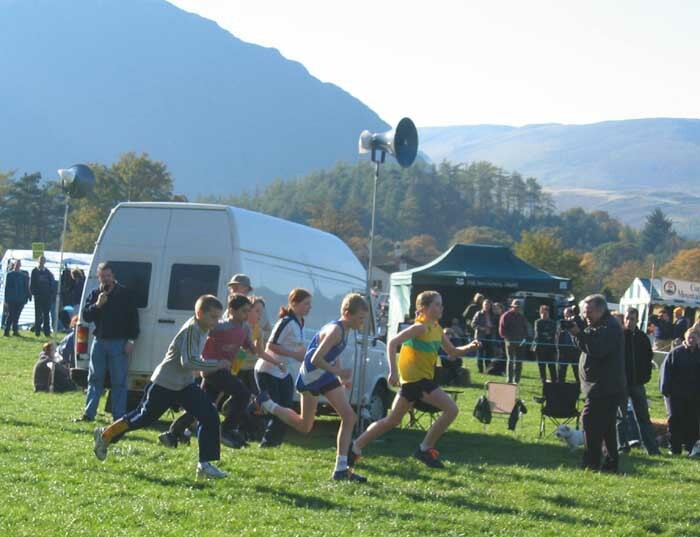 The start of the under 14's fell race. 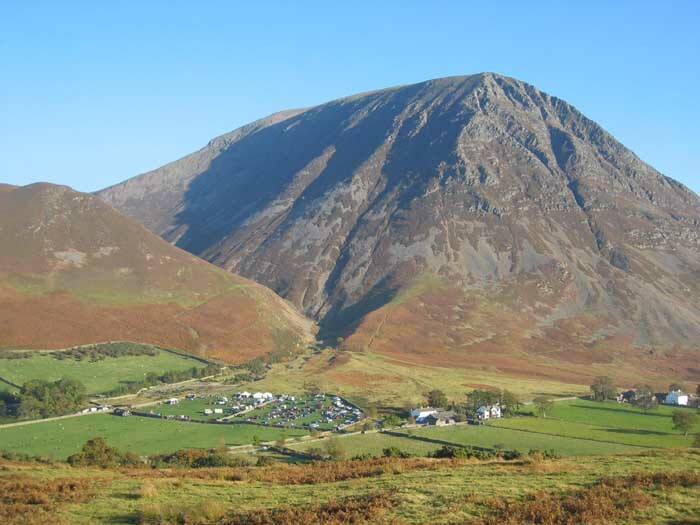 Down the field, a short way up the lower slopes of Grasmoor, then back. 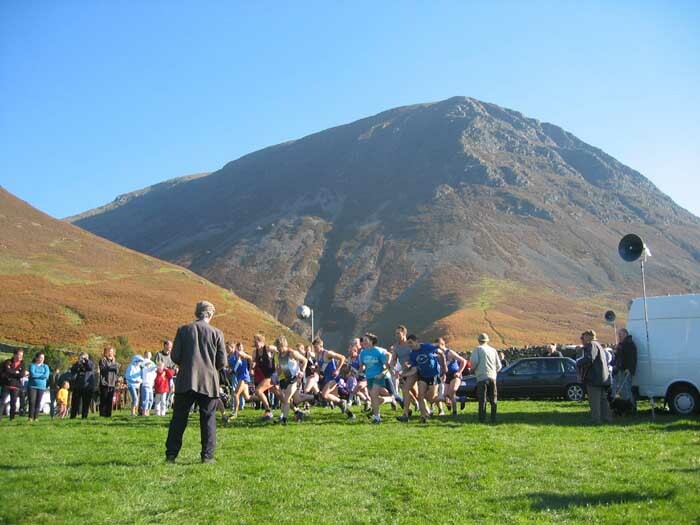 The Senior Fell Race - a big event with a good number of entries. The route took them out of the field and across Gasgate Gill, up to the top of Whin Benn and back. It was about one and a half miles in total, including 1200 feet of ascent. The winner was up and back in about 15 minutes. 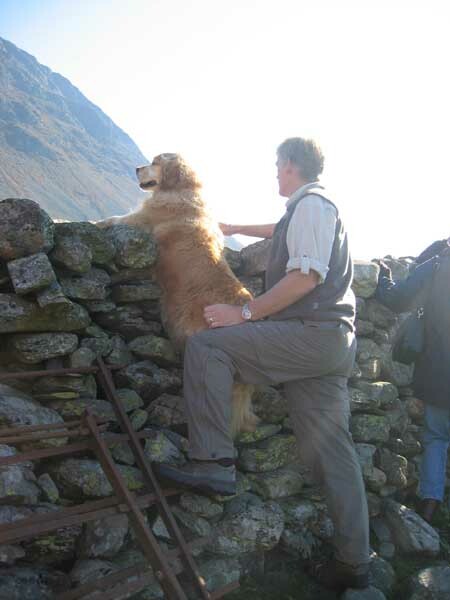 We too were watching the events unfold over the wall, but Holly was shouting for a different race in the second shot. Over the wall was the finish line for the hound trail. 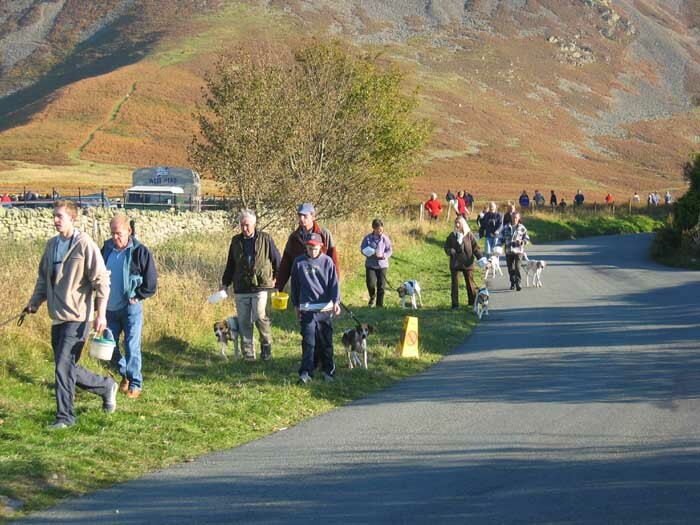 Hound trailing is like fell running for dogs, they follow an aniseed trail , and compete against each other. It's fox hunting without the fox !! hence the presence of these local bookies. Safely back after the race. 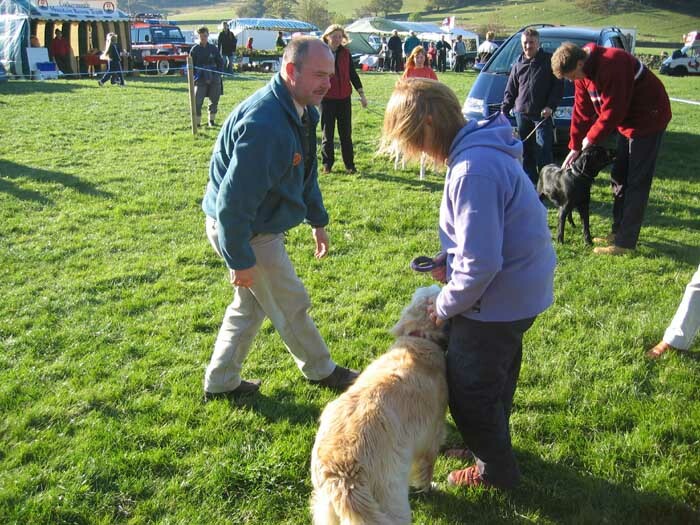 Meanwhile back on the field, we entered our two into the competition for the best Gundog. Well there's always next year to try for a prize. Cumberland Wrestling kids style - girls final. 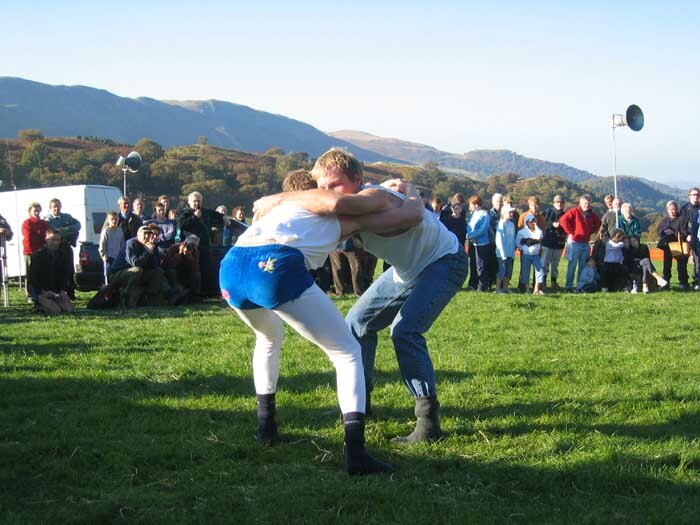 The idea is to clasp hands behind you opponent and to knock him/her off balance so that he/she falls to the ground first. Best of three falls wins, but don't let go or it counts as a fall against you. Seniors "all weights" semi final. 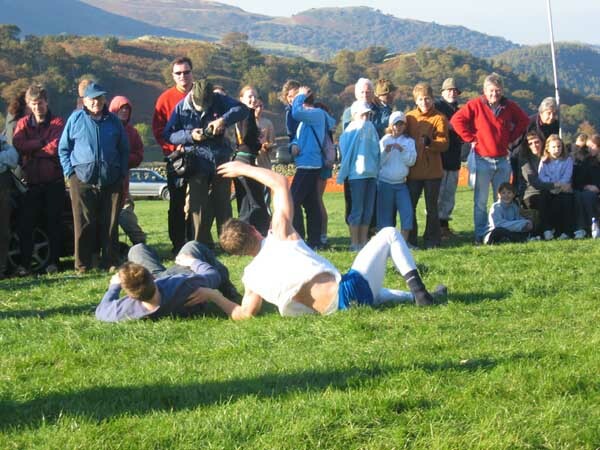 Second fall and a win for the guy in the white T-shirt. 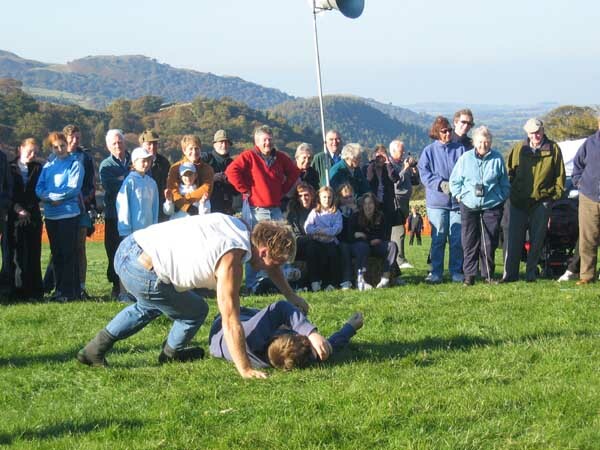 A flying fall and win to the young chap in the white costume. 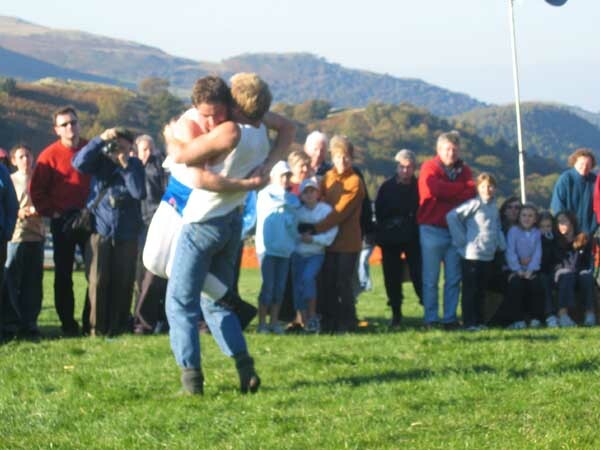 The Grand Final - The lad on the left (I believe) was the under 18's world champion a short while back, but he was defeated on the day by the stronger man in the jeans and grey socks. Their technique was much more matured and cunning than the juniors. The costume of whites with coloured embroidered shorts are traditional to the sport. A flying lift and fall, the leg behind the knee is an attempt to keep upright. An excellent end to the day. Our return home we diverted via the local viewpoint of Lanthwaite Hill. The brilliant weather had provided cloudless skies from dawn to dusk. 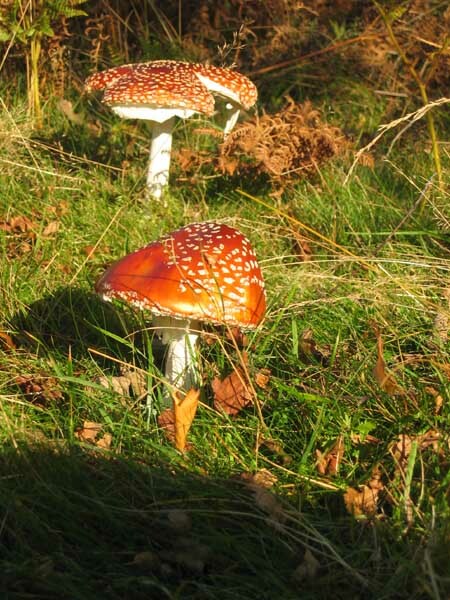 Fly Agaric Toadstools in Lanthwaite woods - to good to miss the photo on the way back. This site best viewed . . . with a cup and winning rosette.